The French news site Mediapart has released another document it claims shows that French President Nicholas Sarkozy and his close associates had maintained backdoor ties to the Libyan government from 2005 to 2011, including a 2005–6 agreement to allegedly funnel 50 million Euros worth of Libyan money into Sarkozy’s campaign chest. The December 10, 2006 letter in question is said to be an official correspondence between Bashir Saleh Bashir, then-head of the Libyan African Investment Portfolio, the LAP and Moussa Muhammad Koussa, former head of the Mukhabarat el-Jamahiriya (the intelligence service) who in March 2011 quit his post as Foreign Minister and fled to the UK. In the letter, Moussa informs Bashir that per the results of the two men’s October 6, 2006 meeting Sarkozy’s chief of staff Brice Hortefeux and the arms dealer Ziad Takieddine, the LAP would be responsible for making payment of 50 million Euros to Sarkozy’s election campaign. The Libyan document released last week is the first new piece of evidence to be presented by the outlet since French terrorism lawyer Jean-Charles Brisard’s walking back of testimony he gave that had described alleged secret 2005 conferences between Sarkozy’s people and the Libyan regime in 2005. The document is the latest piece of evidence reported by Mediapart in a now 10 month-long investigation into Sarkozy’s alleged ties to the deceased Libyan dictator. Jean-Charles Brisard, a French counterterrorism expert, had previously provided Mediapart with testimony from a French doctor associate of Takieddine and documentation of contacts among French Interior Ministry staffers, Takieddine and members of Qadhafi’s family, notably Saif al-Islam, former director of the Qadhafi International Charity and Development Foundation, and former military intelligence head Abdullah Senussi, who is wanted in France for his alleged role in the bombing of UTA Flight 772 in 1989. Anonymous sources told Reuters last month that the French government is very interested in winning Senussi’s extradition to them because of his contacts with French officials and defense contractors. This October 6, 2006 meeting would have taken place a year to the day following an alleged October 6, 2005 meeting between some of the principal players in this drama. 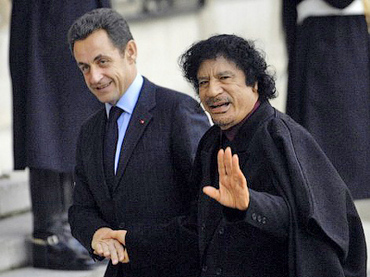 That 2005 contact reportedly took place during Sarkozy’s only known official visit to Libya. The 2005 meeting recorded by Brisard is said to be where the 50 million Euros payment was first discussed with Hortefeux, with the option of using a front company in Panama and a Swiss bank account to conceal the transactions. Mediapart did not note how it came into possession of the 2006 memo; the outlet’s 2005 sourcing come Brisard, who has since sought to distance himself from the materials of his cited by Mediapart by stating that the testimonies he has gathered “have no probative value” and that Mediapart was misrepresenting his research. For the record, Sarkozy’s official campaign spending for the 2007 election was approximately 20 million Euros, just short of the maximum spending ceiling for candidates. Takieddine, according to Mediapart, was the primary fixer between Sarkozy’s team, in particular Hortefeux who made the 2005 visit, as well as Claude Guéant (who replaced Hortefeux as Minister of the Interior last year) and Thierry Gaubert , Hortefeux’s predecessor and a confidant of Sarkozy’s. Takieddine reportedly sought to advance his own agenda of securing sweet deals for French firms with him as the broker through these get-togethers. Amesys, a French IT firm, has also been implicated in these dealings, having sold “Internet-interception equipment” to the Libyan government in 2007, whoch until early 2011 the regime used to monitor dissidents. Takieddine is thought to have helped broker this agreement, and earned a cut of US$500,000 from the deal, which after Qadhafi’s fall became hugely embarrassing for the telecommunications firm. Takeiddine also reportedly tried to make arrangements for Sakrozy’s 2005 visit by getting to discuss refitting contracts for the Libyan Air Force, now no by the UN from making orders to European defense majors, outside of the purview of the French Defense Ministry. The arms dealer denies being present at these meetings, but says he believe that this agreement is authentic, claiming to have spoken with an irate Saif al-Islam in March 2011 about the funding and having seen documents he thought Gaubert would fear becoming public. Takeiddine says he is not sure whether the transaction actually went through or not in the end, but Saif al-Islam told him it did and actually went on TV last spring to accuse Sarkozy of “stealing” from the Libyan people. Takieddine’s testimony is suspect, of course, because he is currently being investigated by a French court for his possible role in a scandal over kickbacks and money-laundering from the sale of warships to Pakistan and Saudi Arabia going to French politican Edouard Balladur’s 1995 presidential campaign. Sarkozy acted as Balladur’s spokesman during that campaign, and Gaubert was investigated last September over his alleged role in securing kickbacks for the 1995 campaign. Takieddine is thought to have maintained contact with the Saudis to secure further kickbacks under Sarkozy’s watch. The Pakistani ties are currently being investigated as a possible motive in a 2002 terrorist attack in Karachi that left 11 French nationals dead. This isn’t the first time key Sarkozy asosicates have come under scrutiny for alleged financial wheelings and dealings: at least two of his associates have been investigated for influence peddling. Sarkozy denies the allegations, as do all of his associates from the Interior Ministry. It is not clear what effect this election year scandal has had on Sarkozy’s 2012 presidential campaign, but he is widely expected to lose his reelection bid to the Socialist candidate François Hollande, coming in second to him in the first round of elections. The second round of voting, and expected Sarkozy defeat, will take place on May 5–6.